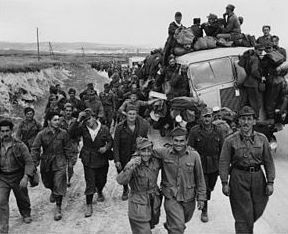 On this date in 1942, one day after the largest amphi­bious inva­sion force in his­tory to that time landed Allied troops on the Alge­ri­an and Moroc­can coasts, Ger­man troops, tanks, and air­craft starting pouring into neigh­boring Tunisia from bases in Italy. Opera­tion Torch, under the command of Gen. Dwight D. Eisen­hower, saw Amer­i­can troops meeting rela­tive light French Vichy resis­tance as they made their combat debut in the North African theater. (The opposing Vichy forces were poorly armed and equipped as a result of the Franco-German armis­tice of 1940.) The Amer­i­cans’ bap­tism under fire occurred in rugged terrain in west­ern Tunisia. There Field Marshal Erwin Rom­mel’s Afrika Korps momen­tarily halted Allied plans to push east­ward and link up with Gen. Ber­nard Mont­gomery’s British Eighth Army, which was advancing west­wards from Egypt through crumbling Axis-held Libya. The battle at Kas­serine Pass, a 2‑mile‑wide gap in one of the Atlas Moun­tains chains in west-central Tuni­sia on Febru­ary 22, 1943, left 6,000 Amer­i­can casualties. The green, poorly led U.S. Army II Corps, pitted against a blooded, expe­ri­enced, well-trained, and bril­liantly led Axis force, was pushed back over 50 miles from its posi­tions in the ini­tial days of the battle. 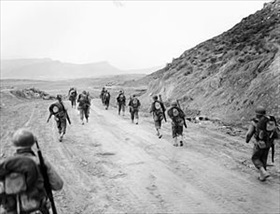 Despite their earlier dis­array, ele­ments of the U.S. II Corps, rein­forced by Brit­ish reserves, rallied and held the exits through moun­tain passes, defeating the efforts of Ger­man and Ital­ian forces to retake the North Afri­can offen­sive. Kas­serine Pass was the last Ger­man offen­sive in North Africa, due in large part to Adolf Hitler’s fixa­tion with restoring Nazi Ger­many’s fort­unes in East­ern Euro­pe following the loss of the Ger­man Sixth Army at Stalin­grad (Febru­ary 1943). Rom­mel, who had con­sidered Amer­i­can troops a non-threat in North Africa, was dev­as­tated by the turn­about; he secretly left the thea­ter during the second week of March, three days after Maj. Gen. George S. Patton was placed in com­mand of II Corps, with the expli­cit task of im­proving its per­for­mance. Rom­mel’s replace­ment in Tunisia, Col. Gen. Hans-Juergen von Arnim, was cap­tured by Brit­ish Com­mon­wealth forces on May 12, 1943, and the remaining Ital­ians—at Benito Mus­so­lini’s direc­tion—sur­ren­dered the next day; more than 275,000 soldiers entered capti­vity, ending the Allies’ North African campaign. Above: Sketch map of Tunisia during the 1942–1943 North African Cam­paign. In the weeks following the Torch landings in Morocco and Algeria in early Novem­ber 1942, the intent of the Allied com­mand was to press the Ger­man and Ital­ian forces in their Tunisian strong­hold against the Medi­ter­ranean and force their sur­render. It happened but not until May 1943. Above: In February 1943, elements of Rommel’s Afrika Korps attempted to seize Kas­serine Pass, gate­way to Algeria, by a sud­den, swift attack. A hodge-podge of U.S. and Free French units attempted to hold the pass. Ger­man infan­try infil­trated around the defenders by climbing the heights on either side of the pass. Stuka dive-bombers, escorted by Messer­schmitt Bf 109 fighters, entered the fray. 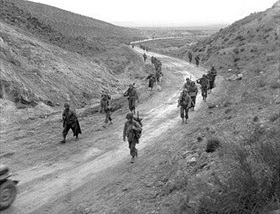 On Febru­ary 20, 1943, the pass was in Ger­man hands. As the Ger­mans con­tinued their effort to push the Amer­i­cans back into Algeria on the morning of Febru­ary 22, they ran into con­cen­trated artillery fire. On Febru­ary 23, the Amer­i­cans cau­tiously advanced east­ward to dis­cover the Ger­mans had with­drawn. Con­cerned that Mont­gomery’s British Eighth Army might attack him in the rear while he was moving west, Rommel aban­doned the battle­field and retired to the east. These photos show Ameri­can units moving through the open pass. 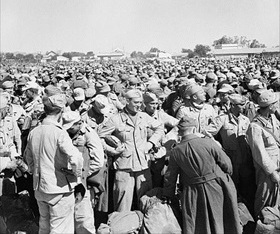 Left: In this photograph Italian prisoners of war are seen being herded out of Tunis as the British V Corps entered the capi­tal on May 7, 1943, the same day Amer­i­can armored and infan­try divi­sions pushed the retreating Ger­mans out of the port city of Bizerte in the north of the coun­try. At 12:30 on May 13, one day after Mus­so­lini had named him Field Marshal, Gio­vanni Messe sur­rendered the remainder of the Italian First Army. Right: After the fall of Tunis and Bizerte, Axis troops began sur­rendering in such large num­bers that they clogged roads, im­peding the Allies’ mopping-up opera­tions. In the second week of May enemy pri­soners totaled over 275,000, many winding up at the Gro­ma­lia POW camp (shown here), four miles out­side Tunis. When Axis gene­rals began sur­ren­dering on May 9, 1943, the six-month Tunisia Cam­paign entered its final days. Vic­tory in Tunisia did not come cheaply. Of 70,000 Allied casu­al­ties, the U.S. Army lost 2,715 dead, 8,978 wounded, and 6,528 missing. At the same time, how­ever, the Army gained thou­sands of sea­soned offi­cers, non­com­mis­sioned offi­cers, and troops whose experi­ence would prove deci­sive in sub­se­quent cam­paigns. These sea­soned sol­diers would not have long to wait or far to go, for the next test was only two months and 150 miles away, the Ital­ian island of Sicily and Operation Husky.